On September 22nd, The Dons’ Wood-Fired Pizza sponsored the Finish the Race 5K run. In addition to sponsoring the event, The Dons provided refreshments onsite by bringing its portable Wood-Fired Brick oven. Participants from the 5K were welcomed with free pizza slices to recharge after their early Fall morning run. The event was very successful and the portable oven was the place to be after the event. The following is a reprint of an article from Rocky’s Road, a mentoring program co-founded by pro football linebacker Rocky McIntosh. On May 19th, we were the guests of The Don’s Brick Oven Pizza in Sterling, Va. Our focus for this month’s field trip was healthy eating. It took some time to find a kitchen that could accommodate everyone in Rocky’s Road but luckily owner, Waleed Zarou stepped up to the plate. Zarou who is a great guy, fellow christian, and married father of three was more than happy to help us with some healthy pizza preparation. The students arrived just on time as we had plenty of learning, work, and eating to do. They were split up into 4 groups and sent to various stations: pizza making, table manners and etiquette, dough tossing, and face painting/animal balloon making (we had to throw this good old fashioned fun in:). Rocky spent most of his time running from station to station cheering, taking pictures/video, and doing a little eating on the side. The students were involved in every aspect of preparing the pizza. They saw how dough was made and rolled it out themselves. Next the cut was made for the crust and then it was time for the toppings. They threw on some veggies such as mushrooms and other toppings like olives and pineapple. Finally 3-4 minutes after they popped it into the oven Presto! The pizza was made. It was a great day all around for everyone that participated. The students learned about to make better food choices and had a fantastic time as well. So how good was the pizza? Don’t take our word for it! Check out the pictures to see what everyone thought!!! The Dons joined Northern Virginia Magazine’s St. Patrick’s Day celebration in Lorton by serving up samples to over 400 NoVinian taste testers! Be sure to subscribe to The Dons YouTube channel as well. The Dons needs your help, please vote for us in NoVA Wars. The Dons first bracket vote is Friday, March 2nd. One vote per IP address. The page is Flash-based, so many smart phones will not display it properly. NoVA Wars is back, and this time we’re pitting the local pizza parlors up against one another! 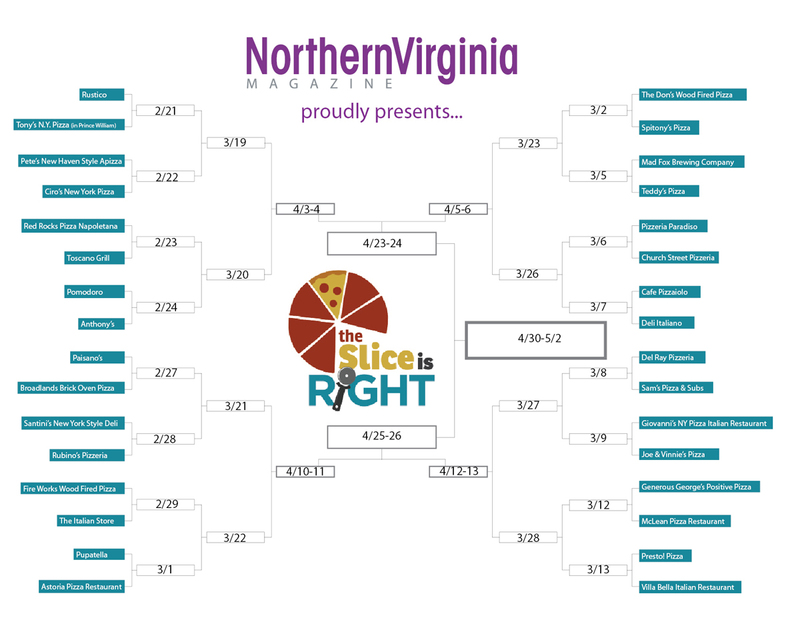 Who slings the best pie in NoVA? You decide! You may vote once per IP address per day. (Note: Most offices share one IP address.) Voting will be open from 10 a.m. until 8 a.m. the following day. Check the bracket for daily updates! The Best of NoVA 2012 poll is now closed. See the results in the June issue of Northern Virginia Magazine, on newsstands May 31. Thanks to everyone who helped us out! 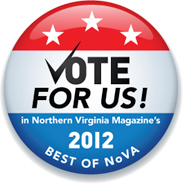 Vote The Dons’ Pizza as Northern VA Magazine’s Best of 2012. Leave votes for at least 10 categories. You can leave a vote for The Dons’ Pizza by placing its name under Dining / Artisan Pizza category. Votes can be made more than once, but are limited to 1 per day. Voting Ends in March and the winners for all categories will be displayed in the June issue. Calling a place a home is more than a simple address. It is the community, culture, shops and restaurants that make a place worth living. Here, we ask you to tell us what is the Best of NoVA, and the best of each county. Vote for the overall Northern Virginia region in our Best of NoVA poll, and then click on your county link and tell us the Best of your specific area. Your response to at least 10 categories is required. It was standing room inside and outside this year at The Dons! We appreciate everyone coming out and supporting The Dons Pizza on behalf of Africa Missions and a special thanks to the Washington Redskins guests – Lorenzo Alexander, Rocky McIntosh, Kedric Golston, Roy Helu, Logan Paulsen, and Graham Gano. We had a great time and a great crowd with Free Pizza served by the Redskins, Redskins Autographs, and live music by Amy Jo & Friends. Please leave your comments and be sure to follow us on Twitter, YouTube, and Flickr (photos are online)! Mark your calendars, on Monday December 19th, The Dons’ Pizza will host it’s 3rd Annual Free Christmas Dinner. The event will run from 6:00-8:00 pm. Special guests include Kedric Golston, Lorenzo Alexander, and several other Redskins. Live Christmas Music will be performed by Amy Jo and Friends. Pizza & Drinks are free – donations will be accepted to raise funds for Africa Missions. 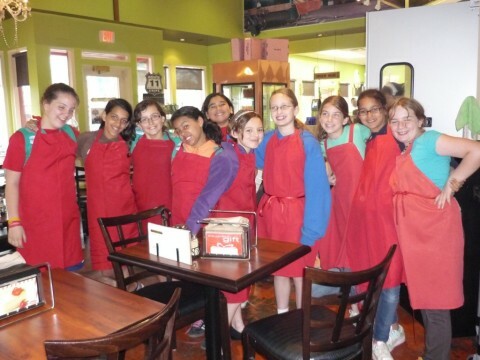 Bronze Award Honorees: Junior Girl Scout Troop 6651 took over The Don’s Wood Fired Pizza in Cascades Market Place to host a pizza-making session for students from The Aurora School in Leesburg. Photo courtesy/Barbara Fink. Junior Girl Scouts earn bronze: The members of Cascades-based Junior Girl Scout Troop 6651 earned a Bronze Award for planning and hosting a learning session focused on pizza making during Autism Awareness Month (April). The troop crafted the session especially for students from The Aurora School in Leesburg, a learning center for students ages 2 to 22 with autism or other conditions who may be unable to reach their potential in a traditional classroom setting. Aurora Director Jennifer Lassiter taught a class for the Scouts in advance of the pizza project to help them understand the communication challenges experienced by youngsters with autism. To help the Aurora students learn life skills, the Girl Scouts taught the pizza-making session in a “learning kitchen” set up like a home kitchen. Waleed Zarou, owner of The Dons’ Wood-Fired Pizza in Cascades, helped the Scouts learn how to make pizza and donated the supplies for the project. The girls worked on the Bronze Award project with the guidance of troop leader Susie Harding. Act quickly within the next day to take advantage of today’s Groupon featuring The Dons. 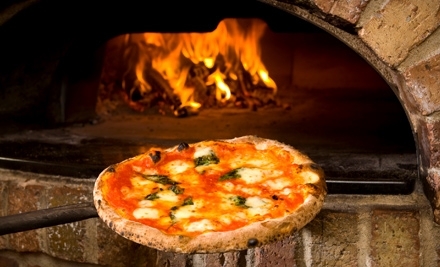 Grab a piece of the pie with today’s Groupon: for $12, you get $25 worth of pizza and more. Limit 2 per person, may buy 1 additional as a gift. Limit 1 per table. Limit 1 per visit. Dine-in only. Must purchase a food item. Offer Expired – was for Super Bowl Weekend Only. Get your Super Bowl Party started with some special offerings from The Dons !